As soon as I got engaged, I pretty much knew my who my bridesmaids would be - my 3 little sisters and my 3 best friends from different points in my life. My oldest sister and friends just got a text/call like hey, so, you want to be a bridesmaid? Ok, cool. It was very casual. But for my littlest sisters (who are 10 and 12), I wanted to do something a little more exciting, especially since they were VERY enthusiastic about the wedding ever since they found out I got engaged. I had seen lots of cute "Will You Be My Bridesmaid?" ideas on Pinterest, some of which were really nice gift boxes. Unfortunately for me, most of the ideas out there were alcohol-centric, and, well, that doesn't really work for younger bridal party members! So I had to come up with a way to craft something that would be age-appropriate and cute for my Junior Bridesmaids. I ended up making the boxes shown below using my wedding colors and theme as inspiration. This turned out to be a really fun project and the best part, by far, was witnessing my sisters' excitement once they opened their boxes! To make some of your own for your younger bridal party members, follow through the steps below. Psst - if you want a useful worksheet with step-by-step instructions so you can make some awesome boxes of your own, there's a link at the end of this post! The best way to start making some "Will You Be My Junior Bridesmaid?" Boxes of your own is to begin by using the color palette and theme for your wedding as inspiration. The ones I made were largely based on the colors of my wedding (watermelon, coral, aqua & teal) as well as our tropical/tiki theme. This is also a good point to start brainstorming ideas for items that you might want to include in your boxes. It's good to have at least some idea of what you'd like to give to your Junior Bridesmaids so that you make sure you get a box that will fit everything (Step 3). The next step is to determine what you will use for a "Will You Be My Junior Bridesmaid?" card. There are lots of options on Etsy so it's a good place to start your search. I've seen some other crafty options out there where brides will design their own homemade cards, use letter stickers to ask the question on the inner lid, or even paint the proposal out by hand. It all really depends on your personal preference! My favorite cards on Etsy matched the look & feel of our wedding theme most closely and could be customized with my sisters' names which was really nice. I wanted them to have something they could save as a keepsake so these cards from Riley Writes Scout ($3.25 each) were perfect. The next step is to find the perfect box. This process goes hand in hand with Step 4 since the size of the box can define your contents and vice versa. It's good to have some idea of what you'll be putting in each box so that you can make sure everything will fit. At the very least, you should make sure that the box you choose accommodates the "Will You Be My Junior Bridesmaid?" card you've chosen. There are a lot of options for containers that you can use out there. I've seen everything from wooden boxes to cardboard boxes and tin containers. I ended up selecting these wooden boxes at Jo-Ann's ($7.99 each). I liked them because they were a manageable size to ship, would fit the "Will You Be My Junior Bridesmaid?" cards in their lids, latched close (so everything wouldn't fly all over the place en route across the country), and could be repurposed by my sisters after the fact. I also had a plan to decorate the boxes so I knew these would be fairly easy to paint. Next, is one of the most fun parts - choosing the contents of the boxes. This is where your wedding colors and theme really come into play. Some options for good items (depending on the age of you Junior Bridesmaid) could include: candy, jewelry, sunglasses, nail polish and/or makeup, toys or trinkets that match your theme, fabric swatch of the Junior Bridesmaid dress, information about your wedding, confetti, photo(s) of you and your Junior Bridesmaid, candle, soaps, filler for the bottom of the box, and hair accessories. When I started shopping, I realized I couldn't pick anything too bulky due to the sizes of the boxes I had bought. For instance, I really wanted to include some tiny pineapples (they're just so cute, right?) but they were unfortunately just a little too big. Between the cost of the boxes, custom cards, and contents, each box came out to about $20. I decided to customize each of the boxes so that they would be an additional item for each of my sisters to keep and to use. I've also seen lots of other ideas where the boxes are left plain or where the brides have found pre-decorated boxes or already interesting containers (like painted tin boxes). It's definitely not necessary to decorate the boxes yourself but it is a fun way to customize them for your Junior Bridesmaids! If you plan on customizing your boxes, now is the time to gather up some supplies. There are a ton of options you can use to decorate but some of these things might come in handy: acrylic paints, painter's tape, stamps & ink, wood letters, paint brushes, foam brushes, Sharpies, Mod Podge, washi tape, stickers, lace, twine, glitter, wood glue, and ribbon. 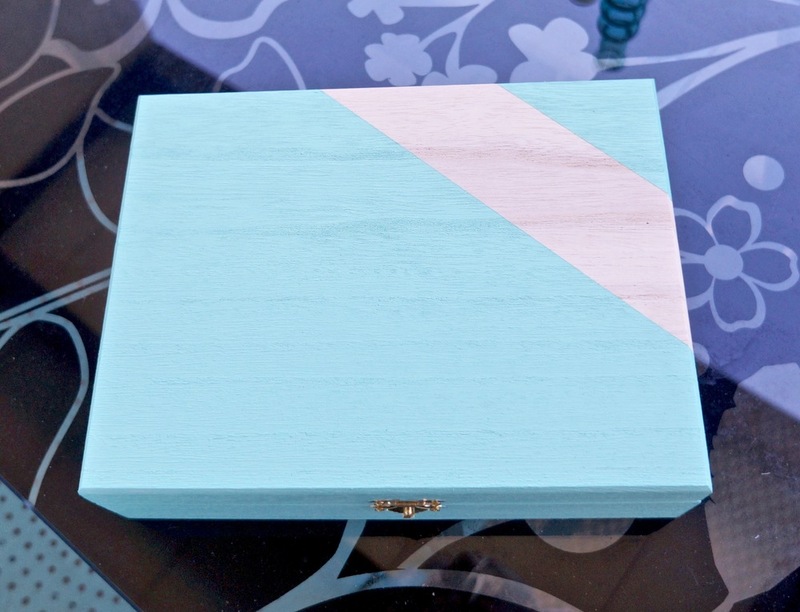 What you choose really depends on what you've got in mind for the look and feel of your box! You can really get decorating supplies anywhere but the majority of mine were found at Target. I already had some acrylic paints at home but I wanted to get some pre-mixed colors that matched my theme and wedding colors just to make things easier. One of the most useful things I found was a box of wood letters. Those were perfect for customizing the boxes with my sisters' names! Everything I ended up gathering for this project is pictured below (minus the painter's tape & wood glue). Now it's time to really determine how you want to decorate your "Will You Be My Junior Bridesmaid?" box. It's worth making some sketches before you start so you have a game plan. Here are some quick doodles I did for mine. These helped me figure out the color palette for each box as well as where the decorative stripes and names would go. If you plan on decorating your boxes in a similar way that I did, the following steps will show you how. Paint the wood letters. It helps if they're secured to the sticky side of a strip of painter's tape. Use a strip of painter's tape (about 2" wide) to section off the areas where the decorative lines will go (securing it very tightly so that paint doesn't seem under its edges). Give the boxes a few coats of their overall color (going easy around the tape edges and drying in between each coat). Carefully remove the first strip of painter's tape after the paint has dried. Reapply strips of tape to section off areas for colored stripes and paint those areas individually. Make sure to use paint sparingly especially on the first coat to make sure that you get clean edges and nothing sneaks under the tape! Use multiple coats of paint when necessary, waiting for paint to dry before removing tape, and repeating for each new color stripe. After the final stripe has dried, remove the last strips of tape & carefully run a blade between the lid & bottom of the box to loosen areas where the box may have gotten painted shut (oops!). Admire your beautifully painted boxes! Finally, it's time to fill your box with its contents! To make a box like the ones I made, attach your "Will You Be My Junior Bridesmaid?" card to the lid with some colorful washi tape that matches your color palette. This tape is particularly good if your Junior Bridesmaids decide they want to remove their cards and save them elsewhere since it has a very gentle adhesive. Then, arrange the contents neatly inside of your box on top of the filler you've selected. 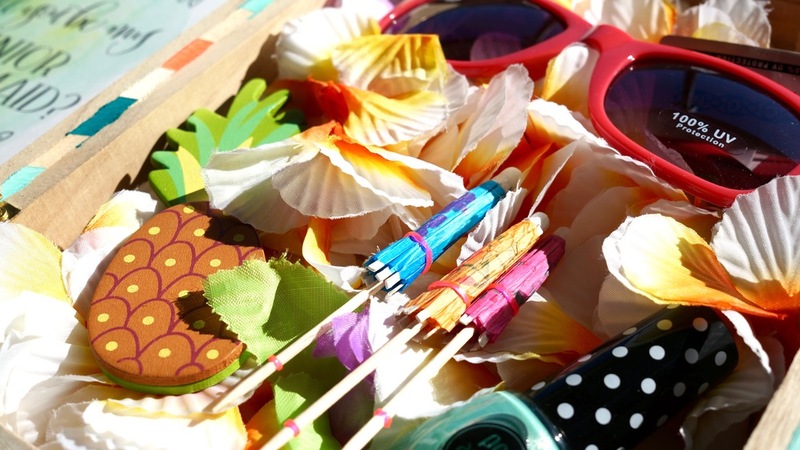 I used leis but more common filler would be crinkle paper or tissue paper. If you plan on mailing your boxes, it's good to add some personal notes on top of the contents asking your Junior Bridesmaids to contact you if their answer is "Yes!" 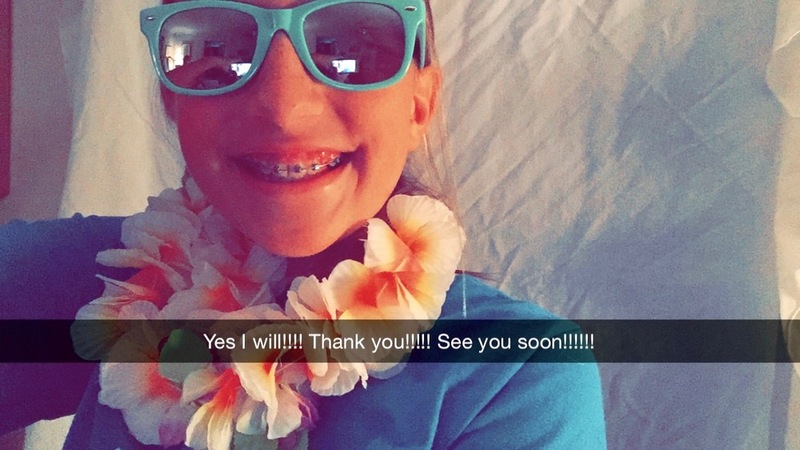 I used some of my Shag stationary to ask my sisters to text me selfies while wearing their leis and sunglasses. To finish up, add some folded up tissue paper on top of the contents to help secure them & prevent damage to the cards taped to the lid. If you plan on mailing the box, be sure to wrap each one (I used tissue paper and washi tape) and pack very securely to make sure they don't get damaged en route. After mine were all packed up, they were on their way from Los Angeles to New York! STEP 8: WAIT FOR THE RESPONSE! Now it's time to see how your Junior Bridesmaids react. If they're anything like mine, they will be very excited to join your bridal party! When the boxes I shipped finally arrived in New York, I got some awesome texts which were then followed by some very excited Facetiming with my sisters. While I made these boxes specifically for my Junior Bridesmaids, they could obviously be customized for any members of the bridal party or for entirely different occasions altogether! Want to make some of these boxes for your own? Download a free 2-page worksheet with step-by-step instructions here!